The Vegas Golden Knights have lost for just the fourth time this postseason, falling to Washington 3-2 in Game 2 of the Stanley Cup Final. Marc-Andre Fleury has prevented Vegas from losing consecutive games so far this postseason. After giving up four goals in the Western Conference finals opener against Winnipeg, the three-time Stanley Cup champion helped the expansion team win four straight against the Jets. He allowed four goals in each of his team’s two losses to San Jose in the second round and gave up three in the following games to help Vegas get past the Sharks. Game 3 is Saturday night in Washington. The Washington Capitals are clinging to a 3-2 lead against the Vegas Golden Knights late in the third period in Game 2 of the Stanley Cup Final. Vegas had a two-man advantage for 1:09 early in the third, but couldn’t get the puck past Braden Holtby. The Golden Knights were outshooting the Capitals 10-2 in the final period of regulation only to be denied time and time again by Holtby. Washington and Vegas combined to score at least two goals in each period of the opener and in the first and second periods of Game 2. Vegas leads the series 1-0. After Wednesday night, the series shifts to Washington for Games 3 and 4. The Washington Capitals are 20 minutes away from evening the Stanley Cup Final at one game apiece. The Capitals have a 3-2 lead against the Vegas Golden Knights after two periods of Game 2. Lars Eller pulled the Capitals into a 1-1 tie late in the first period and he assisted as Alex Ovechkin and Brooks Orpik gave them a two-goal cushion that lasted for 8-plus minutes. Shea Theodore feathered a fluttering puck through traffic and past Braden Holtby late in the second period, bringing Vegas within a goal. Washington’s Jakub Vrana almost restored the two-score lead late in the second period, but hit the right post much to the delight of Vegas goaltender Marc-Andre Fleury. Holtby went into the third period with 22 saves and Fleury had stopped 17 shots through two periods. The series shifts to Washington for Games 3 and 4. The Washington Capitals have earned a rare cushion in the Stanley Cup Final. Brooks Orpik scored midway through the second period, giving Washington a 3-1 lead over the Vegas Golden Knights in Game 2. It marked the first two-goal lead either team had other than the Golden Knights’ empty-net goal in the closing seconds of their 6-4 victory in Game 1. Alex Ovechkin has scored his first Stanley Cup Final goal, taking advantage of a power play to give Washington its first lead of Game 2. Ovechkin one-timed a shot from the bottom of the left circle after Lars Eller’s cross-crease pass to put the Capitals up 2-1 against Vegas. Eller scored a game-tying goal late in the first period. Ovechkin was in the spotlight more than usual after a relatively quiet performance in the series-opening loss in which he had only one assist. The 13-season veteran might need to step up even more because Evgeny Kuznetsov is questionable to return because of an upper-body injury. Kuznetsov, the leading scorer in the playoffs, walked off the ice late in the first period after appearing to hurt his left wrist in a check by Brayden McNabb along the boards. The Washington Capitals and the Vegas Golden Knights are tied at 1-1 after the first period of Game 2 in the Stanley Cup Final. James Neal revved up the home crowd, opening the scoring with a wrist shot past Braden Holtby just 7:58 into the game. Just as the Capitals did during the series opener, they answered. Lars Eller slapped a shot into an open net late in the first period after missing an opportunity to score late in the Game 1 loss that included a record four lead changes. Eller scored shortly after the Capitals generated chance at least temporarily making up for the loss of Evgeny Kuznetsov. The leading scorer in the playoffs left the game after getting checked and appearing to hurt his left wrist. Vegas’ Brayden McNabb hit the leading scorer in the playoffs as he had the puck along the boards late in the first period. Three-time Stanley Cup champion Marc-Andre Fleury stopped 11 shots for the Golden Knights. Holtby withstood a flurry of shots in the opening minutes and finished the first period with nine saves. The expansion Golden Knights entered the game 11-1 when scoring first in the playoffs. The Capitals also fell behind in every round this postseason and rallied to win. The Vegas Golden Knights lit the lamp first, scoring midway through the opening period of Game 2 just as they did in the Stanley Cup Final opener. James Neal got behind Washington’s defense and sent a wrist shot from the left circle past Braden Holtby 7:58 into the game. Vegas also took a 1-0 lead in Game 1, striking first when Colin Miller scored 7:15 into a game the Golden Knights ended up winning 6-4. The expansion Golden Knights entered the game 11-1 when scoring first in the playoffs. It was 98 degrees at game time in Las Vegas. Game 2 of the Stanley Cup Final is under way in Las Vegas. Imagine Dragons kicked up the pregame festivities a notch, playing its hit ”Whatever It Takes,” following the Vegas Golden Knights’ elaborate show that precedes each game. The Washington Capitals trail Vegas 1-0 but are used to playing from behind. Washington fell behind in each of the first three rounds and rallied to win. The Capitals opened the playoffs with two losses to Columbus before roaring back to win four straight. They lost Game 1 in the second round against Pittsburgh before bouncing back with a win in Game 2 and eliminating the two-time defending champion Penguins in Game 6. Washington won its first two games against Tampa Bay in the Eastern Conference finals, but then lost three straight, forcing the franchise to win two decisive games to advance. If the Capitals end up winning the Final, they will join the 1991 Pittsburgh Penguins as the only Stanley Cup champions to trail in every series. Hours before Vegas hosted Washington in Game 2 of the Stanley Cup Final, fans filed in the plaza outside T-Mobile Arena on a 98-degree day in the desert. Some of those gathered were holding the hottest ticket in town. Many planned to simply soak up the atmosphere while watching the game on big screens outside the arena with thousands of new friends. The Golden Knights’ logo was worked into hairdos of fans willing to make the commitment while others opted to have their face painted in black and gold. The Strip has hosted countless events over the years, featuring stars on stage and in the ring. 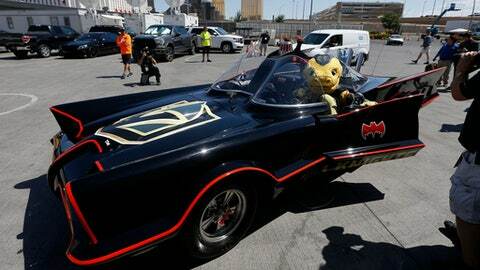 Las Vegas can now add a championship game in a major professional sports league to its list. And, Game 2 of the Stanley Cup Final has a tough act to follow. The Vegas Golden Knights opened with a 6-4 win over the Washington Capitals, co-starring teams that combined for a Final-record four lead changes. There also were big hits, some which might have lingering effects Wednesday night. Washington’s Tom Wilson was penalized for blindsiding Vegas’ Jonathan Marchessault after he passed the puck in Game 1. Ryan Reaves scored a tying goal Monday night after appearing to get away with cross-checking Capitals defenseman John Carlson.